Home maintenance is a necessary chore to maintain the safety and value of your home. Monitoring and fixing home issues at their early stages are very important steps that reduce cost of repairs and time spent doing them. With a little know-how, most home owners can complete many home tasks themselves, especially if issues are not longstanding. If issues are put off, they can become large issues that homeowner cannot take care of themselves, instead needing to spend lots of time and money contracting a professional. The start of summer is the perfect time for home owners to take stock of their investment and figure out if work needs to be done. The good weather makes outdoor chores more bearable and issues more easily identifiable. Days are also longer, and some can even check off a few items from their list after work on weekdays. Knowing what to look for and prioritizing home fixtures is an important step. There are several home entities that should constantly be monitored, as they can become big problems very quickly. There are also those that should be closely monitored because they are big money fixes and must be budgeted and prepared for. We will go over a few of these home maintenance issues and give tips on how to maintain your biggest investment. The roof of your home fills a very important need in protecting you and your home from the elements. It is also one of the costlier fixes as well as being harder to monitor, especially during the wet season. Roofs not only can be patched and fixed incrementally, but not noticing a leak or missing shingles can cause many more expensive issues just under the roof that you may not know about. Do a quick walk around check of your roof, looking at condition of shingles and looking for loose or broken ones. Check all seals and breaks in the roofing material, such as where skylights, satellites, and chimneys are located. There should be no accumulation of water, and no visible signs of seams or creases where water could be entering your home. Check inside of all skylights and make sure there is no moisture or stains around outside of cocking as this is tell tale sign of water leakage. Also do this with all windows, big and small. Chimney should be monitored for structural integrity and all bricks and mortar should be checked to make sure it is all in working order. Chimneys are cheap to maintain but expensive to repair or replace. The gutters of a house are often taken for granted. They provide a needed function to the home without being noticed, until they no longer are working as they should. Gutters can very easily get large debris clogs, rip off of home, or spew excess water close to homes foundation. All of these issues are easily monitored and easily maintained, but if not watched closely can spell huge problems for you and your home and cost lots of money to fix. Now that leaves and debris has fallen from trees and weather is nice you should clean all of your gutters thoroughly. While cleaning, look for any areas where gutter may be separating from home and simply tighten those areas. This will prevent gutter from ripping off of house, destroying wood where gutter was fastened and bending gutter. Gutter downspouts should also be monitored as they should be shooting water down and away from foundation of the home. Excessive standing water around homes foundation will weaken structure and potentially cause damage that is unfix able, thus destroying your home. Land around your home should slope away and a market rate of 6 inches over a span of the first 10 feet from your home should be achieved. If that is not possible, home should have gutter system installed. While checking downspouts and standing water issues, also make sure that there are no cracks or shifting in homes foundation. Consult a professional immediately if this is the case. All outside wood entities of your home should be checked. This includes siding, decking, fences, gates, arbors, sheds, and any other wood garden structures. Wood can last a long time if maintained properly but also disintegrate in short amounts of time if not coated and monitored properly. Not monitoring decking can not only be very costly, but create a very unsafe area for your home. 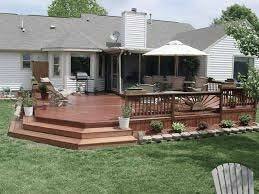 Decks are utilized much more in the summer months and should be checked for safety before the children of your home partake in its grandeur. Put a fresh coat of sealant or paint on all external wood structures and clean surface beforehand. Make sure all wood is sealed and repair any rips or hardware issues. Wood siding on a home should be repainted every three to seven years and summer provides the rights climate to do so. Before painting, do a quick structural check and fix any minor issues before starting the first coat of paint. Paint is a very cheap way to add to a home’s look and value and is a chore most any homeowner can accomplish with a little sweat equity. Remember that the maintenance of your home is your job and can be a rewarding en devour that provides you a sense of accomplishment as well as maintaining the safety and value of your families largest investment. Don’t put off smaller issues and always closely monitor the internal and external workings of your home. You might even get some vitamin B and a tan out of it.